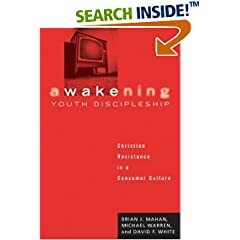 I recently finished Awakening Youth Disciple: Christian Resistance in a Consumer Culture. This short book is a series of essays by three authors: Brian J. Mahan, Michael Warren, and David F. White. I have read White's book Practicing Discernment with Youth, which was a phenomenal resource for helping youth develop skills for examining their lives and culture. So I came into this book with some high expectations. And I wasn't disappointed. 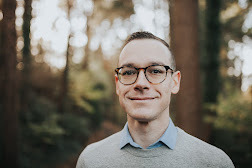 The basic premise of the book is that consumer culture has negatively affected the American church, specifically in the arena of youth ministry. The authors wrestle with the paradox of fostering long-term disciples in youth in a consumeristic culture. It's an academic book written from three unique perspectives, which I found challenging but worthwhile. They go on to discuss how youth frequently don't see any other alternatives. If they want to fully follow Jesus, their only viable option is full-time ministry--becoming a pastor or missionary. Otherwise, they have to conform their faith to the societal norms of consumerism, individualism, and materialism. The authors propose that there is an alternative--living out Christian vocation and being a disciple of Jesus, resisting cultural norms while also choosing to not separate oneself from the world. I find myself wrestling with this same dichotomy in my own ministry. If I ask my junior high students to really follow Jesus, it seems almost impossible to function normally in society. Our culture is based around consumerism--how can we resist an entire culture? So the simplest option seems to be this: create a new culture outside of the normative culture, a new Christian culture. We see this in Christian clothing, movies, books, music, and social groups--aka youth groups. Otherwise, Christian youth don't seem much different than "secular" youth in their practices and values. I don't like my options. Either I have shallow disciples who associate with Christianity but are conforming their faith to the culture; or I have disconnected disciples who cannot fully function in normative society and follow Jesus at the same time. I even wrestle with this as a pastor--do I go to seminary or a "secular" graduate school for my master's degree? Seminary seems valuable to learn more about theology, but it takes oneself out of the culture at large. Grad school seems valuable in engaging academic culture and learning to interact as a follower of Jesus in society. Both would likely give me skills to become a better pastor, but in strikingly different ways. Is there is a third option? Can we be disciples of Jesus, resisting the temptations of consumer culture, while also being actively engaged in our society in meaningful and healthy ways? Can we give youth alternatives to this dichotomy--the culture vs. Christianity--or are we stuck with one or the other? I pray that we can. Thanks for reviewing this book. It is one that is on my list of possible reads, but I wasn't sure about it. It sounds great and I completely relate to what you wrote about the options of segregation from the world versus becoming saturated in the world.